With more than 6,000 mountain bike products listed, finding the best gear to view and review on singletracks can be a challenge for the uninitiated. Fortunately we've developed a set of tools to make your search go smoothly. To get started, choose the category you'd like to view. From the homepage you can use the search bar in the middle, select one of the major categories, or scroll down to the bottom of the page for a full list of categories. 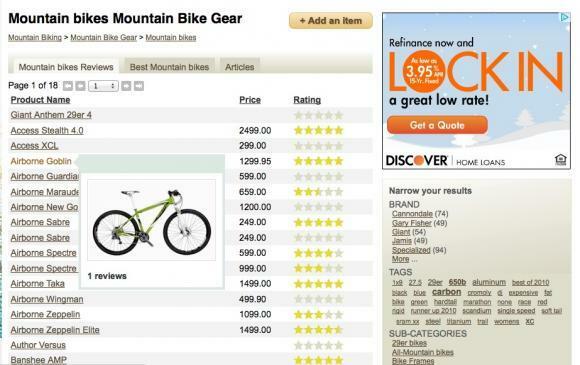 Looking at the Mountain Bikes category, you can see there are over 1,000 bikes to choose from. You can sort the list by name, MSRP, or average rating and you can use the numbered links to jump to a particular page. Clicking a sort link a second time results in a reverse sort. Roll your mouse over any product link in the list to view an image of the product along with summary stats about the item. For certain categories like mountain bikes, we've provided sub-categories to help narrow your search (for example 29ers, hardtails, etc.). Sub-category links can be found in the column on the right. Just below the sub-category links there are links to 7 brands within the category (example: Cannondale). You can expand this list by clicking the"more brands" link at the bottom of the list. This is a quick way to drill down when you know what you're looking for. Below the brand links there is usually a list of "tags." Tags are simply descriptive words that help filter products even further. For example, in the mountain bike category you can use tags to find just carbon bikes or bikes that come in the color red. Sweet! Beyond the average product ratings, we've ranked products within each category based on the rating, number of ratings, and number of wishlist entries. We also compile a "best of the year" list based on reviews and wishlist entries during the model year that is linked separately from the "best tab." 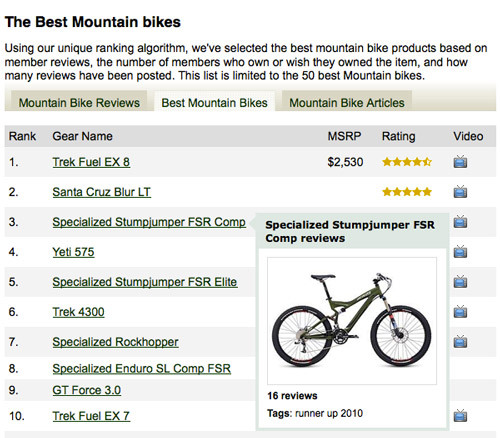 The best tab is limited to the top 100 mountain bike products in each category. The daily singletracks blog publishes dozens of in-depth mountain bike product reviews each year and on the "pro review" tab you can find links to those articles. In addition to individual product reviews, the pro review tab also includes links to buyers' guides and how-to articles. 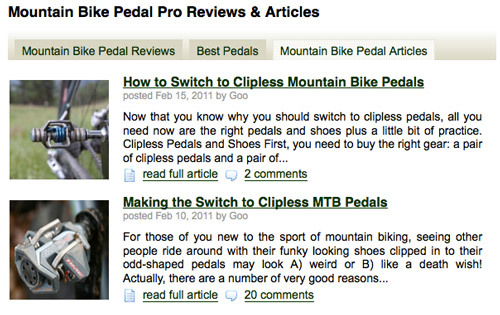 Now that you know how to find MTB product reviews on singletracks, now it's time to learn how to use the gear review pages!